It is a great privilege to exhibit the photography of four outstanding artists/photographers. We call the show The I of the Camera because each photographer is so unique and so talented. They are Robert Leslie, Builder Levy, Barry Rosenthal, and Michael Weschler. Each sees the world through a lens that captures something or someone in a manner that is so caring, so personal, and so fascinating. Robert Leslie, "Aztec, New Mexico," 2009, C-Type, 20 x 30 inches. UK born Robert Leslie first visited the US as a child in the 1960s and the endless horizons, energy, and enthusiasm left an indelible mark. Inspired by Barack Obama’s inaugural message of hope, Leslie turned his camera to America for the first time; to photograph its’ “Sun Belt.” Three years later he retraced the same route from Miami to Los Angeles to see how hope had been rewarded. What he found was grim. Communities once vibrant were filled with quiet despair. Stories of financial corruption, recession, and foreclosures poured forth from his car radio and the impact of climate disruption was present at every turn; droughts, forest fires, and hurricanes had left their mark. 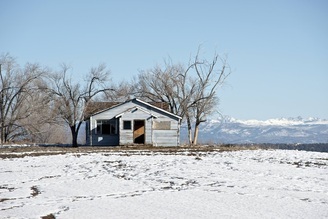 In still but beautiful images, Leslie, an outsider, captured a view of America that needed documenting. Masterfully, he photographed the often overlooked sadness of people who lost their homes, their benefits, their jobs and especially their promise of hope. These images, several shown in our exhibit, are portrayed in a fascinating book titled Stormbelt, 2013. Barry Rosenthal, of Manhattan, is an urban archaeologist, photographer, sculptor and collector. Out of all of this emerges breathtaking photography. He studied photography at the Dayton Art institute in Ohio, and at the Apeiron Workshops in Millerton, New York. His photo art images are in the permanent collection of the Museum of Modern Art, New York, and the Springfield Museum of Art in Massachusetts. His photographs have also been published in art and culture magazines and news publications around the world. His project Found in Nature started in 2007 as an offshoot of his botanical work. 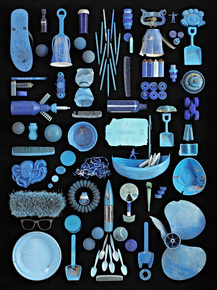 It evolved from miniature collections of found objects into large scale images such as those that represent ocean borne trash. By using a combination of sculpture and photography and breaking down found object trash into themes of type, color, or whimsy, Rosenthal is able to bring awareness to global issues such as ocean pollution or drug abuse. Michael Weschler titles his series Ten Mavericks. Each photograph depicts a man who pursued his dreams with unwavering integrity and tenacity. They include Alexander Wang, star of Balenciaga; Don Jones, former Buffalo Bills football player; John McEnroe, tennis player; Harry Shearer, musician and radio host; Julian Schnabel, artist and filmmaker; Todd English, celebrity chef; actors Liam Neeson and Richard Gere; Denis Leary, stand-up comedian and actor; and Liev Schreiber, actor and stage and screen director. Weschler focuses on making signature images that cut through visual noise, capturing instead the quiet moment. He is intrigued by the dialogue that happens when his camera confronts someone with both strength of character and vulnerability; and he pushes through to get something meaningful. Beginning in 1968, Builder Levy’s encounter with Appalachia has been an obsession for the photographer that spans more than four decades. Once the hunting grounds of the Cherokee, it became the home of colonists who escaped British rule. Since the building of railroads and opening of large coal mines in the late 19th century, Appalachian coal miners have toiled underground. Facing daily threats of lung disease and injury, they have struggled to feed their families while helping to build our nation. Levy has revisited West Virginia and Eastern Kentucky 30 times. He photographs new and old places in the coalfields, connects with old friends, and bonds with people who become new friends. Each time, with a new perspective, Levy documents the massive mining operations, as well as the result to the way of life for coal miners and their families. Levy’s very excellent book, Appalachia USA, was published in 2014. The John and Mable Ringling Museum of Art in Sarasota will host a major Builder Levy Appalachia USA exhibition in the summer 2015.